While the report from Natural News that you can access by clicking on the link below is somewhat dramatic, I nevertheless am recommending you read it, not in order that you swallow it whole, but in order that you have another way of looking at the reality of cancer. There is much information available from many sources about the general topic of alternative cancer care that goes beyond surgery, chemotherapy, or radiation, and unfortunately most of us are not aware of it. As someone who has been through the dark tunnel of cancer (uterine), and who took an active role in treatment, and who continues to take an active role in all that happens to my body, I only want to say this to you: inform yourself, but not only with classical oncologists. Read what others who have had cancer say, read what reports such as this one (and there are countless such reports) have to say. Take the information that resonates with you and only then decide how to proceed. "To state it bluntly, most oncologists are [not particularly intelligent] when it comes to nutrition and vitamin D. Most doctors don't even understand the basics of vitamins, minerals, essential fatty acids and phytonutrients. They're not stupid people, it's just that they've never been taught this information, and they consider it to be too "alternative" to embrace. Doctors have very fragile egos and don't like to be challenged by information they didn't think of first." 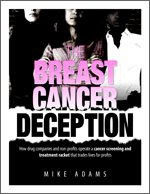 "The cancer industry claims to be empowering women with breast cancer screening, but it is actually guiding them towards a particular diagnosis and treatment plan that enriches the pharmaceutical companies. Keeping women ignorant (especially black women) is a key strategy in this plan, for if women were empowered with the real facts about how to easily prevent and reverse breast cancer, the cancer industry would lose millions of customers and billions in profits." "Even Dr. Ralph W. Moss -- a cancer expert from the world of conventional medicine who -- couldn't resist pointing out the hype surrounding Herceptin. He's published numerous articles questioning the Herceptin hype, and authored his own report called Herceptin - Or Deceptin?.In an article written for New Scientist magazine, Dr. Moss explains that Herceptin is practically useless for most women, and that the drug only prevented breast cancer for 0.6 percent of women in one trial. Yes, that's less than one out of a hundred. And yet Herceptin is widely heralded as a "miracle drug" by ignorant doctors, consumers and politicians." Medicinal mushrooms - reishi, shiitake, agaricus blazei, etc. Red clover - Helps cleanse the blood. Find from any supplement maker.